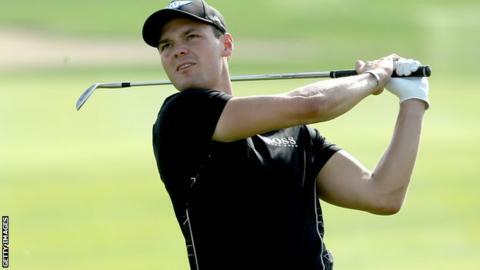 Germany's Martin Kaymer is on the verge of winning a fourth Abu Dhabi Championship title, having opened a six-shot lead after three rounds. The US Open champion had seven birdies in his first 13 holes during a bogey-free round of 65 to reach 20 under. Belgium's Thomas Pieters is second after a two-under-par 70. World number one Rory McIlroy, only two behind overnight, saw a series of putts stay up and only two birdies in a 71 left him tied for fifth on 12 under. McIlroy, yet to add the Abu Dhabi tournament to his comprehensive list of titles, has been runner-up three times in the last four years, but his chances of victory were hampered by taking 34 putts on day three. "I hit the ball as well as I did yesterday, gave myself so many chances and didn't convert any really. Very wasteful and looking like I am playing for second tomorrow," said a disconsolate McIlroy, who had a hole-in-one in round two. Kaymer has now gone 42 holes without dropping a shot and on the rare occasion when he did find trouble he produced a superb escape on the 10th hole. The world number 12's second shot went left and lodged in a bush, but having taken a drop and then found a bunker with his fourth, he holed out from the sand for a remarkable par five. "The main goal was to still lead the golf tournament, it was a little bit of an up and down round so therefore a 65 is a great score," said Kaymer, who eclipsed Paul Casey's record total for the third round by one shot. Asked whether he was focused on his own tournament record of 24 under set in 2011 he said: "I'm not really thinking about the record but a good score will hopefully mean I will win." Shot of the year winner Jamie Donaldson, the 2013 champion, had seven birdies and an eagle in his 65 and the Welshman shares sixth place on 11 under.